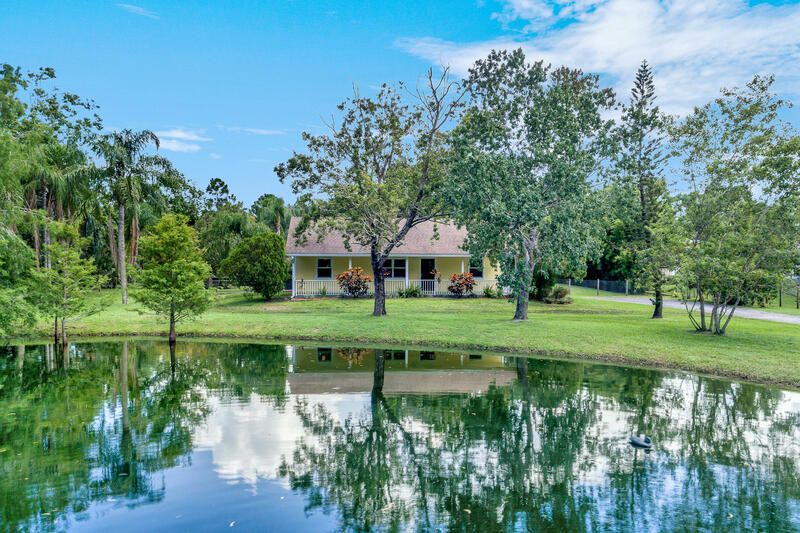 Beautiful home Like a Retreat in this tropical oasis in Jupiter Farms. Hardy Plank siding freshly painted, Hurricane Impact windows, Gourmet kitchen with high end granite counter tops, appliances, farmers basin sink, & recessed lighting. Renovated baths include new sink, toilets, & bath tiles. Exquisite travertine & bamboo flooring, custom black out shades, & blinds, Detached 4 car garage/workshop, guest house a possible in law/apt!! Beautiful covered porch with scenic views of birds, fish in your pond for Bass, bream & tilapia , ducks & birds. Fabulous layout with all the right spaces see Jupiter farms as it was meant to be seen. Waterfront: Pond Yes Pond Ft.